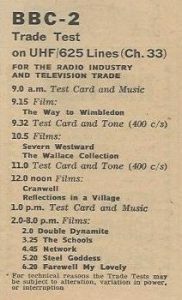 Beginning on Saturday 4 January 1964 and lasting until 18 April, a series of Trade Test Transmissions for engineering purposes was shown between 9.00am and 8.00pm for six days a week (excepting Sundays). 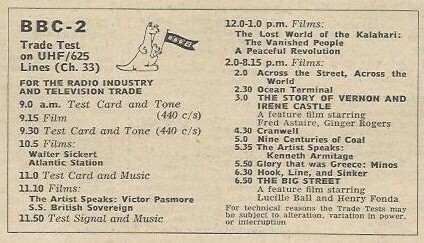 Interspersed with the Test Card, these transmissions consisted mainly of short films which, according to some explanatory blurb in Radio Times (2 January 1964, p. 2), had ‘been carefully chosen for their high technical quality to ensure that the best possible pictures are transmitted during the tests’. 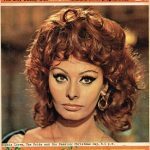 More significantly for this blog, each daily transmission also included a feature film, with an extra one shown on some days. 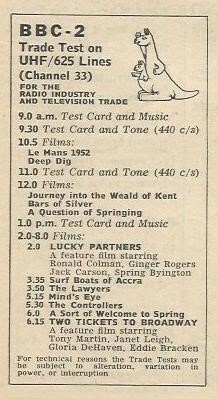 All those chosen came from the library of RKO Radio Pictures, the defunct Hollywood studio from which the BBC had acquired around one hundred titles in 1957. The Corporation’s lease was temporary – much later, in 1979, the BBC would acquire in perpetuity the studio’s entire library of 740 features – but unlike most film package deals it had the advantage of permitting an unlimited number of screenings. 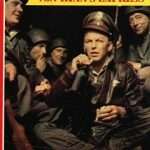 In these terms, then, the first feature shown on the channel was Double Dynamite (1951) with Jane Russell – a pun on the number two, perhaps? 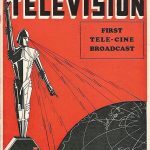 All the films used for the Test Transmissions had previously been broadcast on the main channel over the past six years and their lease was about to expire, so borrowing them for this purpose must have seemed like a good way of milking them for their last drop of value. 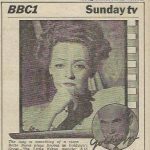 Only two of the test films, Easy Living (1949) and One Hour to Zero (1952), appeared again in regular programme time following the formal opening of BBC2, though all were subsequently reacquired and continue to play a part in off-peak BBC schedules today. In total, the Trade Tests involved 114 transmissions of 28 features over 16 weeks. Each film was shown up to five times, though their frequency was uneven. In the absence of any other information the choice of which titles were screened most often appears quite random, though print quality may have had something to do with it. 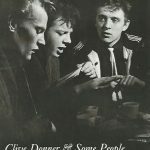 Eleven films were broadcast five times, ten were shown four times, six three times, and one – Stage Door (1937), among the oldest – only twice. 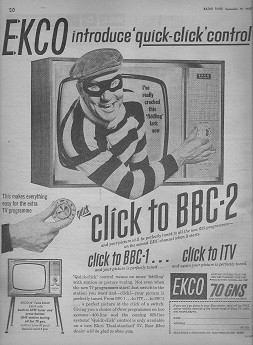 Anyone owning a television set tuned to BBC2 was capable of receiving the test broadcasts which, like the official public schedule once it was launched, were available only in London and the South East. 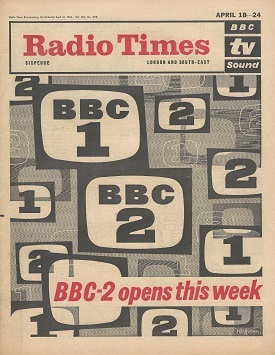 Details of the transmissions were published in London editions of Radio Times but do not seem to have been carried in daily newspapers, so it took a dedicated viewer to catch them. 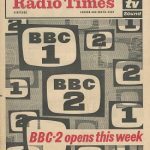 But the most striking aspect of the four-month test period, at least from the vantage point of 2017, is that, with an average of one feature a day, more films were broadcast on BBC2 before it was officially launched than the channel transmits in a typical week today. Next week at time of writing, for example (15-21 July), six features are scheduled for the weekend (four on Saturday, two on Sunday) but none at all on weekdays. And the Test Card has gone for a burton, too. 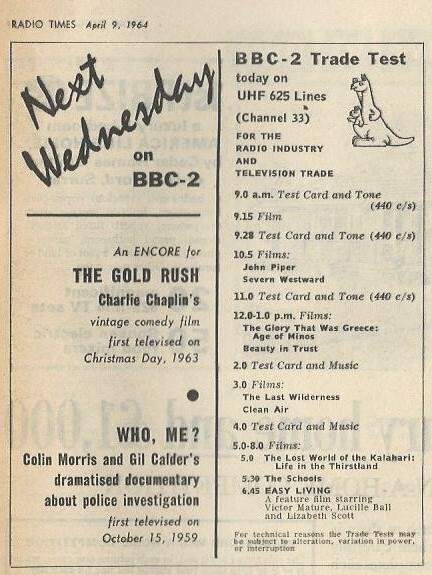 The listing below includes the titles and broadcast dates of all the feature films shown on BBC2 in the pre-launch Trade Test Transmissions, in alphabetical order by title. I wonder if, this being the first time they are grouped together, people at the time realised they were in alphabetical order?! 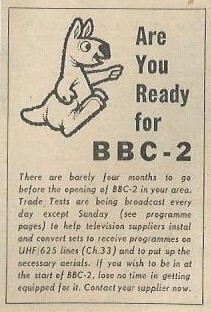 At least one newspaper actually listed the transmission listings – The Express. Thanks for the information, Ben!